Rubber Room Ramblings: PRETTY PETITES SNEAK PEEK! LESS THAN TWO WEEKS TO SALE-A-BRATION~~WOOHOO!! 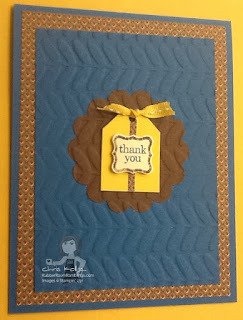 As promised yesterday, this is the card Linda, my demo friend, brought to our demo group to share with us last night. For this card she used the Pretty Petites Stamp Set and the Vine Street Textured Impressions Embossing Folder, both FREE items available in the Sale-a-Bration Catalog. I have one more date the end of January, if you want to hostess a workshop! !